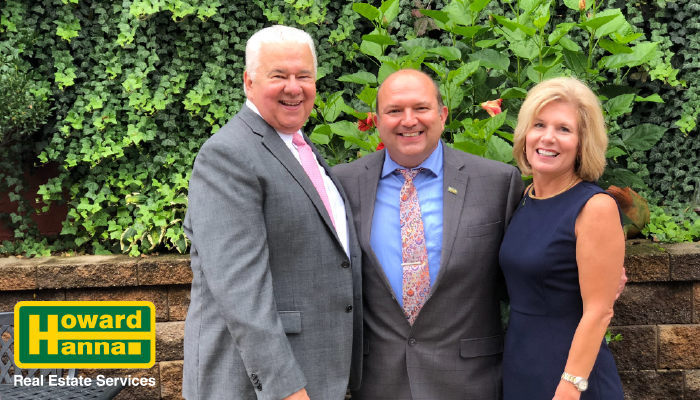 Pittsburgh, PA (October 9, 2018) – On Friday, October 5, 2018 at J. Corks restaurant, Vice President and East Regional Manger Yvonne Guthrie and President of Howard Hanna Pennsylvania Tom Ceponis gathered with the agents of the Greensburg office to announce that Tony Molnar-Strejcek was being named Sales Director of the office. The Howard Hanna Greensburg office is located at 133 Donahoe Road. For all of your real estate needs or to join the Hanna team, Tony Molnar-Strejcek can be reached in the office at 724-832-2300, on his cell phone at 412-638-2272, or by email at tonymolnar-strejcek@howardhanna.com. Pictured L to R: Tom Ceponis, Tony Molnar-Strejcek, Yvonne Guthrie.